The ability to create, play and share your own unique Super Mario levels was a dream 30 years in the making for Mario fans. Turns out it was also a great reason to jump into the Wii U experience. 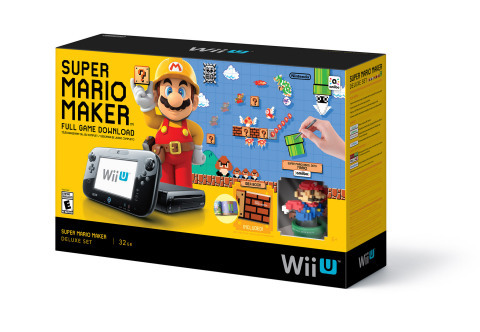 The Super Mario Maker game for the Wii U console launched in the U.S. on Sept. 11 and sold nearly 445,000 combined units in its first three weeks (Sept. 11, 2015 – Oct. 3, 2015), bringing the lifetime total to more than 500,000 combined units in the U.S. alone (Sept. 11 – Oct. 19, 2015). Perhaps the biggest impact however has been on hardware sales. For the full month of September, sales of Wii U hardware in the United States increased by nearly 110 percent over sales in August. Software sells hardware and no one sells hardware like Mario. Through the first nine months of 2015, sales of Nintendo 3DS hardware have increased by nearly 25 percent over the same time frame in 2014. Animal Crossing: Happy Home Designer for the Nintendo 3DS system launched on Sept. 25 and sold nearly 115,000 total units in its first week on the market. That momentum should continue into the holiday selling season, as Nintendo gets ready to launch a series of great games for both of its platforms. The recently released Chibi Robo! Zip Lash (Nintendo 3DS, Oct. 9) and Yoshi’s Woolly World (Wii U, Oct. 16) will soon be joined by The Legend of Zelda: Tri Force Heroes (Nintendo 3DS, Oct. 23), YO-KAI WATCH (Nintendo 3DS, Nov. 6), Animal Crossing: amiibo Festival (Wii U, Nov. 11), Mario Tennis: Ultra Smash (Wii U, Nov. 20), Pokémon Super Mystery Dungeon (Nintendo 3DS, Nov. 20), Xenoblade Chronicles X (Wii U, Dec. 4) and Devil’s Third (Wii U,Dec. 11). *Data regarding physical sales of games in September are from the NPD Group. Data regarding digital downloads of games and combined physical/digital life-to-date numbers are from Nintendo’s internal sales figures. All numbers, unless otherwise stated, are specific to the United States only.